The western blot is an analytical procedure for the detection of specific proteins in a sample of tissue homogenate or cell extract. To run a Western blot or to measure enzyme activity, many assays require access to the materials (e.g. proteins, DNA, subcellular fragments) entrapped in the cell. Sonication is a reliable and easy-to-handle method for controlled cell disruption and lysis. Protein extraction from tissues and cultured cells is the first step for many biological, biochemical and analytical techniques (PAGE, Western blotting, ELISA, mass spectrometry, etc.) or protein purification. To obtain a high protein yield, the cell material and tissue must be efficiently disrupted/ lysed. 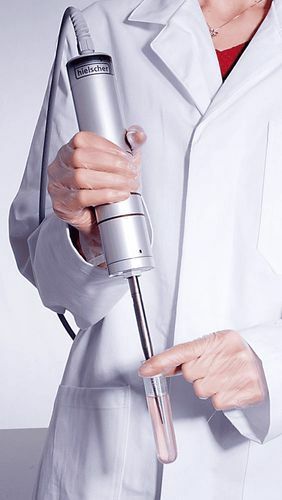 Whether plant cell or animal tissue, sonication is the method to prepare your cell lysate easy and fast. For the preparation of the solutions, use purified water such as Milli-Q. Important: Add 1 mM PMSF immediately prior to use. Harvest the cells. To harvest cells under nondenaturing conditions, remove media and rinse cells once with ice-cold PBS. Remove PBS and add 0.5 ml ice-cold 1X cell lysis buffer to each plate (10 cm) and incubate the plates on ice for 5 minutes. Sonicate twice for 10 seconds in ice-cold immunoprecipitation buffer (IP buffer: 50 mM Tris-HCl [pH 7.4], 150 mM NaCl, 5 mM EDTA, 0.1% NP-40 and the protease inhibitor mix). For sonication, the VialTweeter or a probe ultrasonicator such as the UP100H or UP200Ht are most suitable. Centrifuge the lysates at 15,000 g for 10 minutes at 4°C. The supernatant is then incubated further with the mixture of equal amounts of Protein A-agarose (Invitrogen) and Protein G agarose for another 1 h.
Wash the agarose pellets three times with IP buffer. Afterwards, extract the bound proteins with the SDS-PAGE loading buffer by heating at 95°C for 5 minutes. Take 200 μl cell lysate and add primary antibody. Incubate with gentle rocking overnight at 4°C. Add either protein A or G agarose beads (20 μl of 50% bead slurry). Incubate with gentle rocking for 1–3 hours at 4°C. Microcentrifuge for 30 seconds at 4°C. Wash pellet five times with 500 µl of 1X cell lysis buffer. Keep on ice during washes. Resuspend the pellet with 20 μl 3X SDS sample buffer. Vortex, then microcentrifuge for 30 seconds. Heat the sample to 95–100°C for 2–5 minutes and microcentrifuge for 1 minute at 14,000 X g.
Load the sample (15–30 μl) on SDS-PAGE gel (12–15%). Analyze sample by Western blotting. Total protein was isolated from MC3T3-E1 cells treated with 1,25(OH)2D3 (10−8 M) or vehicle. Cells were lysed with a buffer containing 50 mM Tris HCl, pH 8 (Sigma-Aldrich); 150 mM NaCl (Fisher Scientific); 0.1% sodium dodecyl sulfate (SDS) (Fisher Scientific); 1% IGEPAL CA-630 (Sigma-Aldrich) and 0.5% sodium deoxycholate (Merck). 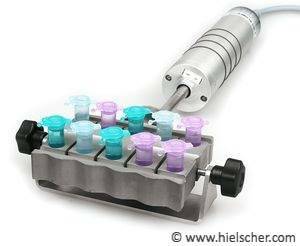 The cell lysate was sonicated for 2 × 10 s at cycle 1 and amplitude 80 with the UP50H Ultrasonic Processor (Hielscher, Ultrasound Technology, Teltow, Germany). Thereafter the material was centrifuged for 10 min at 14,000 rpm and the supernatant was used for Western blotting. Twenty-five μg of protein was boiled in sample buffer and reducing agent (Invitrogen) and subsequently separated by SDS-PAGE using 4–12% polyacrylamide gels (Invitrogen) and transferred to a nitrocellulose membrane (GE health care). The membrane was blocked for 1 h with TBS (10 mM Tris-HCl; pH 7.6; 150 mM NaCl) containing 1% casein (Sigma-Aldrich) and 1% Tris (1 M). After blocking, the membrane was incubated with slight agitation overnight at 4°C with the primary antibody (rabbit anti-human CBS 1/500, developed in the lab of Prof. R. Banerjee, Ann Arbor, MI, USA). Incubation with a horseradish peroxidase (HPR)-conjugated secondary antibody (Dako) was performed for 1 h at room temperature. All blots were developed by enhanced chemiluminescence (Perkin Elmer). Carsten Kriebitzsch, Lieve Verlinden, Guy Eelen, Natasja M. van Schoor, Karin Swart, Paul Lips, Mark B. Meyer, J Wesley Pike, Steven Boonen, Carsten Carlberg, Victor Vitvitsky, Roger Bouillon, Ruma Banerjee, and Annemieke Verstuyf (2011): 1,25-dihydroxyvitamin D3 influences cellular homocysteine levels in murine pre-osteoblastic MC3T3-E1 cells by direct regulation of cystathionine β-synthase. J Bone Miner Res. 26(12), 2011. 2991–3000. Tahrin Mahmood, Ping-Chang Yang (2012): Western Blot: Technique, Theory, and Trouble Shooting. North American Journal of Medical Sciences. 4(9), 2012. 429-434. Blots are analytical procedures where DNA, RNA and proteins are transferred onto a carrier so that they can separated. The Southern blot is used for the detection of DNA, the Northern blot for RNA and the Western blot for proteins. Western blotting is also called protein immunoblotting because an antibody is used to specifically detect its antigen. The Western Blotting is one of the most important analysis methods to detect specific proteins in the sample. In the Western blot, the proteins are immobilized on membranes to detect them using monoclonal or polyclonal antibodies. By SDS-polyacrylamide gel electrophoresis (SDS-PAGE) native proteins are separated by 3-D structure or denatured proteins by the length of the polypeptide. The proteins are then transferred to a membrane (typically nitrocellulose or PVDF), where they are stained with antibodies specific to the target protein. The gel electrophoresis step is included in western blot analysis to resolve the issue of the cross-reactivity of antibodies. Afterwards, the separated proteins are blotted onto a matrix (mostly on a nitrocellulose or PVDF membrane), where they are stained with antibodies. The antibodies function as a probe and are selected specifically to the target protein. The analysis of the location and intensity of the specific reaction reveals expression details of the target proteins in the given sample. Western blotting could detect target protein which is as low as 1ng due to high resolution of the gel electrophoresis and strong specificity and high sensitivity of the immunoassay. The Western blot method is used in molecular biology, biochemistry, immunogenetics and other molecular research fields. Other related techniques include dot blot analysis, immunohistochemistry and immunocytochemistry where antibodies are used to detect proteins in tissues and cells by immunostaining, and enzyme-linked immunosorbent assay (ELISA).